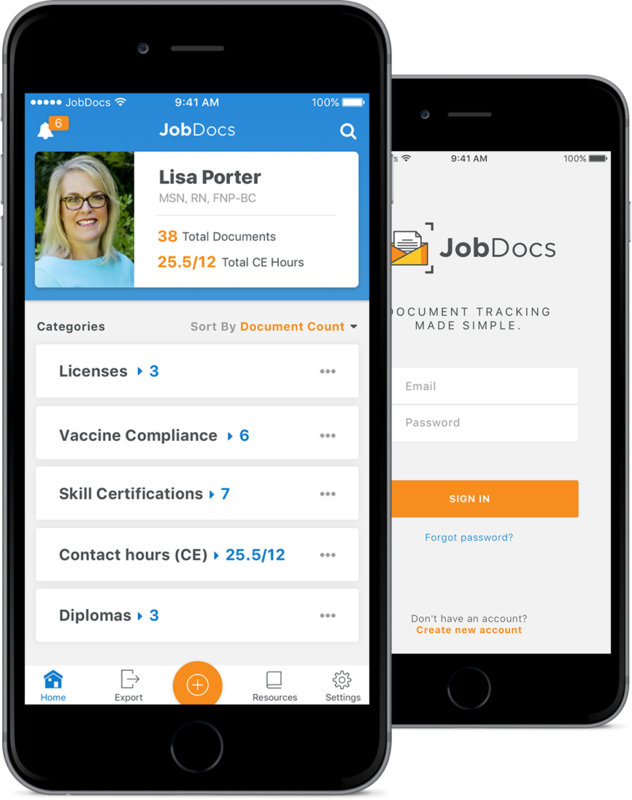 JobDocs is the quick and easy way to upload, organize, and share your job-related documents and certifications. Then app notifications will remind you before they expire! Storing your documents is as easy as taking a photo or uploading a document. 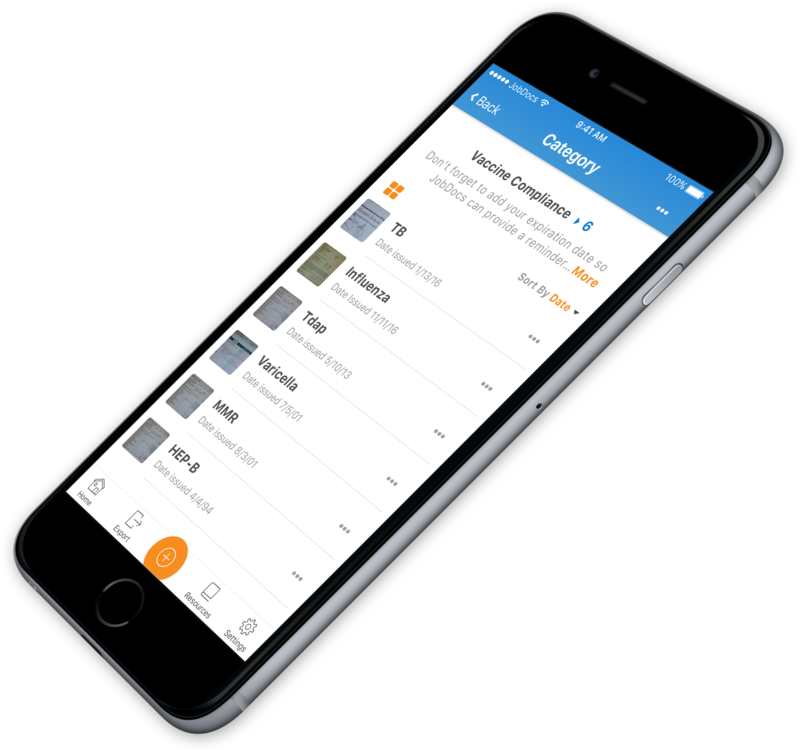 Documents are placed into categories making them easy to find, view, and share. Store all of your required documents in profession specific categories, or you can create your own. Choose a reminder date for notification so you never have to worry about when your certification is expiring. You'll be in control of your own information and never have to wonder where a document is when it's in JobDocs. Documents are easy to store and sort in nursing-specific categories. Or create your own! Just use your phone to take a photo or upload an image or document into its category. All you have to do is name it and add a date if it expires. Select one, some, or all of your documents to email from your phone. Then you'll receive an email confirmation of document sent. 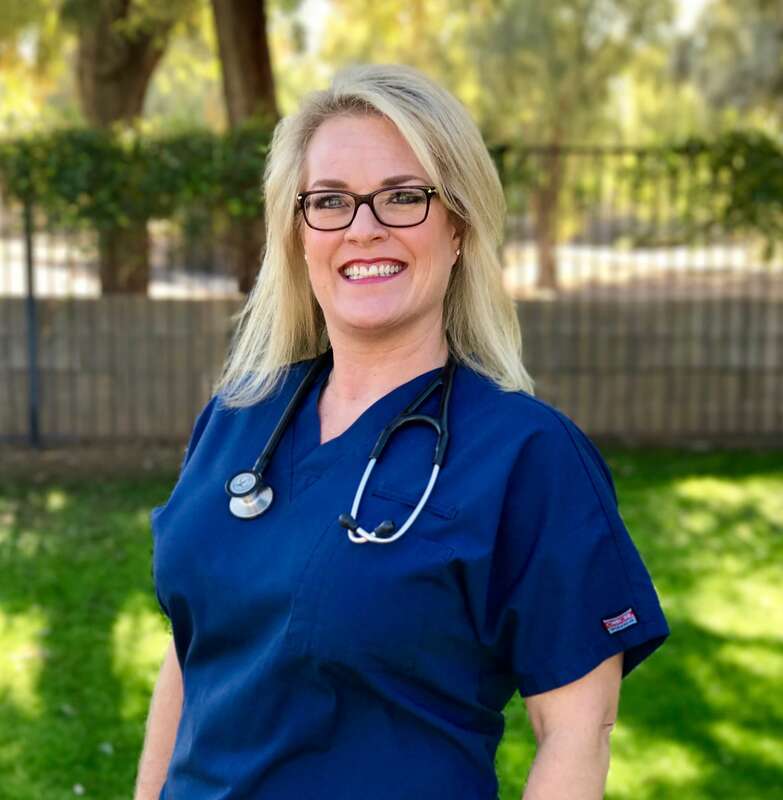 JobDocs was inspired by my own overwhelming problem with the attempt to organize all of the cards, certificates, and documents I need to do my job as a registered nurse and new-grad nurse practitioner. I was so worried about losing something or missing an expiration date that could result in losing pay, my job, or my license. In talking to my colleagues and peers, they all had the same problem! We were using envelopes, folders, and binders, the same way since I started in healthcare more than 20 years ago. I wanted to find a safe and easy app-based solution (I love apps!) because I have my phone with me at all times (so do 95% of nurses!). Copyright© 2016-2019 JobDocs. All Rights Reserved.